A full-color reference for getting the most out of your Samsung Galaxy Tab 10. 1! A vast improvement over the original Galaxy Tab, the 10. 1 uses the latest version of the Android operating system and is a 4G LTE mobile device. A full-color reference for getting the most out of your Samsung Galaxy Tab 10.1! A vast improvement over the original Galaxy Tab, the 10.1 uses the latest version of the Android operating system and is a 4G LTE mobile device. 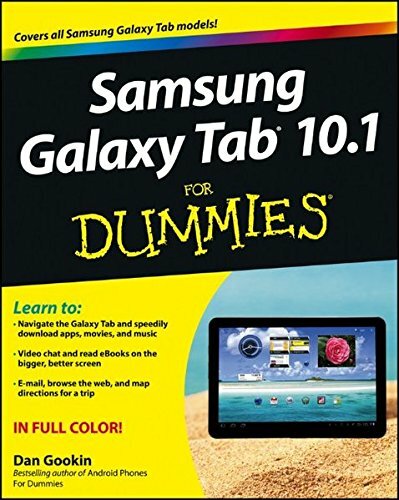 These upgrades along with many others, including the better screen quality, better web browsing with Flash, and better multitasking capabilities are all covered in this fun and friendly guide to the Samsung Galaxy Tab 10.1. Everything from how-to topics to the most useful features to helpful tricks and techniques, this practical guide shows you how to get the most out of this cutting-edge device. Details how the Galaxy Tab 10.1 goes one step further than the iPad with phone communications plus video chat and conferencingExplains in detail how to find your way around the Galaxy Tab 10.1Covers e-mailing, web browsing, using the digital library, connecting with friends in the galaxy, taking photos with the camera, and enjoying musicHighlights how to customize your Galaxy Tab 10.1 so that it's right for your needs Samsung Galaxy Tab 10.1 For Dummies is must-have reading for anyone who wants to go beyond the basics and explore another galaxy of tablet computing!